It could surprise that illustrating monastic life we talk about the indescribable sweetness of love. Yet, it is enough to read one of the pages written by the great monk that was St. Bernard of Chiaravalle (XII Cent. ), commenting the "Song of Songs", to have an idea of the sensibility of the feelings that could palpitate in the soul of whoever really looks for God (revera Deum quaerit). 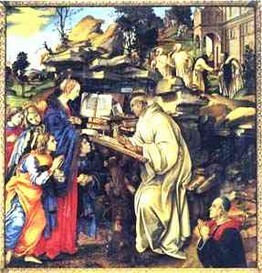 St. Bernard abbot and doctor of the Church. In the liturgy he is called "Lamp that burns and shines. We could be grabbed as he was by the love of the Word of God made man ! Bernard (Digione, France, 1090- Chíaravalle- Clairvaux 20 August 1153), after Robert, Alberich and Stephen, he was father of the Cistercian Order. Obedience and the good of the Church pushed him often to leave the quiet monastic life to devote himself to most serious political-religious matters of his time. Spiritual guide and educator of generations of saints, he leaves in his sermons, comment to the Bible and to the liturgy an exceptional document of monastic theology, inclined, more to the experience of the mystery, than to science .He inspired a devout affection to Christ's Humanity and to the Virgin Mary. Love is sufficient to itself, likes itself and is a reason on itself. At the same time is reward and prize. Love doesn't look for reasons, doesn't look for advantages but itself. His advantage is his existence. I love because I love, I love to love. Love is a Big thing, if goes back to his beginning, if took back to his origin, if brought back to his source. From there always takes substance to continue to flow. Love is the only one between all sentiments of the soul, between feelings and affections, with which the creature could reciprocate to the Creator, also if not on an equal term; the only one with which could repay his neighbor and, in this case, certainly in equal term. In fact when God loves, he desires to be loved. Not for other reason He loves, to be loved, knowing that those people that will love Him will enjoy this same love. The love of the Bridegroom (Christ), and more than that the Bridegroom-love looks only for the exchange of love and fidelity. Therefore, be allowed to the beloved to love back. Why the bride (the soul), and the bride of Love should not love ? Why Love should not beloved ? Justly, giving up all her others affections, she attends whole and only to Love, in reciprocating love she contemplates to equalize it. You will be objecting, however, that, also if the bride will be transformed completely in Love, she'll never reach the level of the perennial font of Love. Certainly it'll be never possible to compare lover and Love, soul and Word, bride and Bridegroom, Creator and creature. The source, in fact, gives much more than what is enough to the thirsty one. But what is the matter ? It will perhaps stop and will completely fade away the desire of the bride that she is waiting for the moment of the wedding, it will ever stop the longing of whoever sighs, the ardor of whoever loves, the trust of whoever foretastes, because he is not able to run at the same level with a giant, compete in sweetness with the honey, in meekness with the lamb, in innocence with the lily, in shine with the sun, in charity with who is Love ? Certainly not. Although in fact the creature loves less, because she is inferior, if she loves with all herself, nothing else can be added. Nothing is wanting where there is everything. Therefore for her to love is having celebrated her wedding, as she could not loves so much and be loved only a little. The complete and perfect marriage depends on the consent of the two; unless, one doubts that the soul is beloved, first and more, by the Word.